I was pretty busy with events and coffee sessions with my companions for the past few days. Somehow I knew that I need a break in between to get myself on the go again for another week or so. Well, like people say "Laughter is the best medicine". Nothing beats a good laugh. It does help one to stay focus and keep the stress off one's shoulders. It is fast and free. However, how I wish we have such places here where people perform some humor, sketches, parodies and skits like in some western countries. I know in the US there are places or theaters which showcase such performances. And, the amazing thing is people love it! I guess it is the best therapy if you are not the type who would love to sit down and pour your problems to a shrink. Instead you can laugh till your heart content. 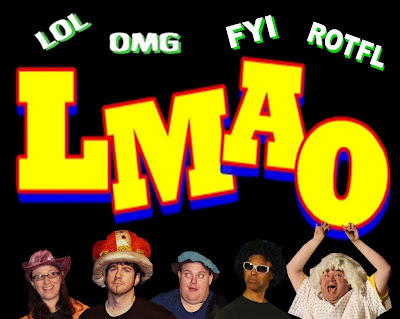 Well, I came across this one site called LMAO Off-Broadway. It is a theatre showcasing hilarious interactive musical comedy revue. It is just the sort of thing that I need at this moment. This show touches all genre of life and is suitable for people from all walks of life too. Isn't that simply amazing? Perhaps people should see how things are seen or shown in a different perspective after all. And, the best thing is people get to laugh about it. This LMAO Off-Broadway also presents some insanely hilarious spoofs on various topics created on the spot. Plus, it is not an ordinary show like any others where audiences are just spectators. LMAO Off-Broadway offers audience's participations. Meaning, the audience gets to decide the topics for every scene! I was really amazed to hear about this. I mean, how many shows out there would let the audience involve and decide on the topics of the show? None so far. But this LMAO Off-Broadway is one of a kind and seriously and hilariously one superb revue one should not miss.